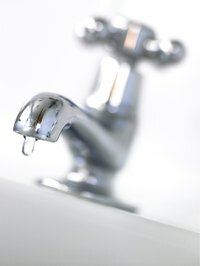 What Makes a Water Pipe Burp Every Time the Faucet Is Turned On? When your faucet pushes out air instead of water, you may have an issue with your plumbing. If the faucet only "hiccups" once or twice and then settles down, the problem is probably minor. But if you get air mixed with water every time you try to use the faucet, the problem might be more serious. If air is being forcibly expelled by your faucet, you may have an issue with your water pump. Sometimes pumps can be a little too powerful, moving too much water through pipes that are not quite large enough. Mix in air pressure adjustment devices, and you get problems like noisy water hammer, where high-pressure water hits pipes too hard and pushes air pockets ahead of the water at high speeds. If your pipes expel air through multiple faucets, it is probably a pump-related issue. A number of valves help turn water flow on and off when you use your faucet. But valves can wear down and spring leaks, and these leaks can let air into your plumbing system, which is then expelled when you turn on your pipes. A valve closely connected to your sink system may be letting air in at a crucial point, creating the effect. In many plumbing systems there are air cushions designed to help the system stop water flow more effectively. Sometimes even without valve leaks or water pressure issues, the pipes filled with air can release some air into the system. Even a small amount can be expelled forcefully from a faucet that is fully opened. Pipes can also develop leaks themselves and let air in, especially at the joints. If you have not had air issues with your faucet before, do not assume something is permanently wrong with your plumbing system. If you run out of hot water or have a new plumbing appliance installed, some air in the system is natural and should dissipate after several uses. Water shortages can also cause this problem even when plumbing equipment is working properly, so make sure the problem is continuous before calling the plumber. What Causes Hiccups With Beer? Why Don't I Have Good Water Pressure in My Kitchen Sink?